The night I was born my big sister gifted me an Eeyore doll with a tail that removed with velcro. I cherish it to this day and it cemented me as a Winnie-the-Pooh fan at heart. I was so excited to check out the exhibit on the phenomenon to learn more about its background and to revisit an old favorite. 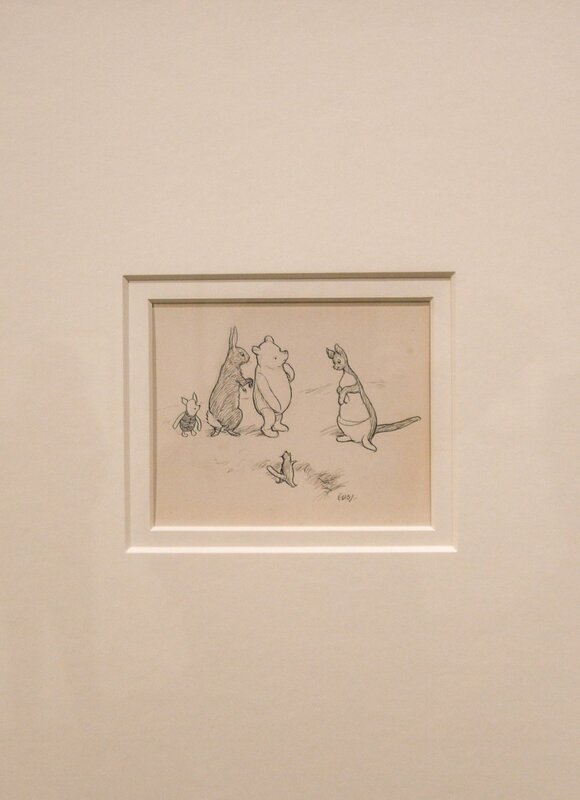 Winnie-the-Pooh: Exploring a Classic has hit the Museum of Fine Arts in Boston and runs until January 6th (make sure to bring your Emerson ID for free admission!). The highly-anticipated exhibit begins with a display of vintage books in various languages, board games, and figurines dating back to its beginning in 1924. The exhibit progresses into a room reminiscent of an old London nursery, complete with pale pinstripe wallpaper, a window nook, and a small bed for children to get cozy and read old storybooks. In this room and the sage green room following, you will learn about the series’ origin and get to see the first sketches and notes of the writer and creator A. A. Milne. As you turn to exit the London bedrooms you enter the storybook world that is the Hundred Acre Wood. Sounds of birds chirping, bees buzzing, and trees rustling can be heard throughout the space. Along the walls children can follow stories of Winnie and friends, and older visitors can enjoy historical notes on the series. Interactive elements such as a sketching table, several scattered reading nooks, a glowing bridge scene that aligns with the story posted along the walls (a great instagram spot! ), and even a little slide invites the public to be a Hundred Acre Wood resident for the day. After passing the model staircase and toddler-sized tent, you can continue into the next room to view the evolution of Winnie and his friends and their character development. The exhibit concludes with publications of the series on display as well as some available to read. It’s evident that the exhibit was designed to entertain both children and their parents and to appeal to the soft spot we all hold for the characters. Cracking open a book that was published in the late 90s instantly transported me to early childhood and I swear one of the framed illustrations at the beginning of the exhibit was hanging in my grandmother’s house. It’s amazing how personal these stories feel to me and so many people. I was somewhat surprised to see that young children were still so excited about Winnie—I guess part of me thought the phenomenon had faded but I’m glad to see it hasn’t. In the exhibit space, I heard various languages spoken and saw people ranging from toddlers to grandparents equally enjoying it. “I thought it was a wonderful exhibit; it was so whimsical and really appealed to the childish whimsy of the books and universe and made it very welcoming for everyone,” says junior James Manley.